How To Brand Your Business — The Denizen Co. Wondering what this whole "branding" thing is about? Everyone’s talking about “branding” – but most of us don’t understand what it entails. We’ve compiled a comprehensive guide that covers the first steps of our branding process for entrepreneurs who are just beginning to visualize their business concept, or may not have the resources to hire a designer at this time. We've got your back. Branding refers to a cohesive system of typefaces, colors, imagery and language that encompasses a brand. Now that we’ve gotten that out of the way, let’s begin. For your own pitch, distill these three criteria into a colloquial 2-3 line paragraph that you could easily pitch to a potential client or investor during a brief elevator ride. Once we have established a color story and typefaces, we are ready to design the logo. We recommend hiring a professional for this step, but if you do not have the resources at this time, try typing your company name out in your designated typeface – likely your header font – and playing around with it, either on Photoshop (download your free trial here) or free graphic platforms like Canva. Experiment with monograms, letter-spacing and adding graphic elements while staying true to your keywords. But don’t overdo it – legibility is key. Alternatively, if you decide that you would like some professional help with your branding, feel free to get in touch with us here. A significant part of branding pertains to language, not just visuals. Notice how the keywords were an integral part of the entire process. 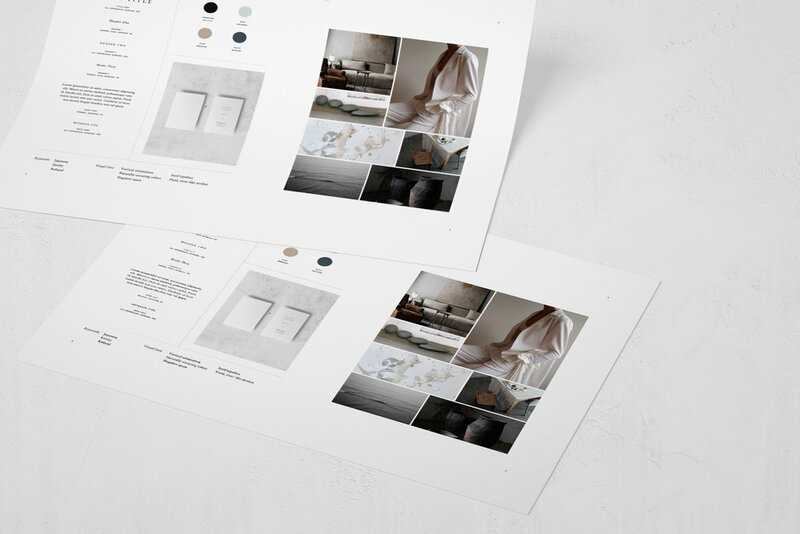 Although it may be tempting to dive straight into color archives and type foundries to develop your brand, take some time to hone down the pitch and keywords associated with your brand first. These will not only serve as the building foundation of your overall look, but also become useful when drafting copy for future marketing materials. Once you’ve successfully crafted a brand identity and would like to apply it to some ready-made print documents or web templates, visit our shop to get started. Our templates include business cards, invoices, pricing guides, media kits, Instagram templates and more. Though our templates are tailored with specific font recommendations, they can easily be swapped out with your designated typeface. Similarly, your logo can be embedded anywhere on your template to further customize your look.